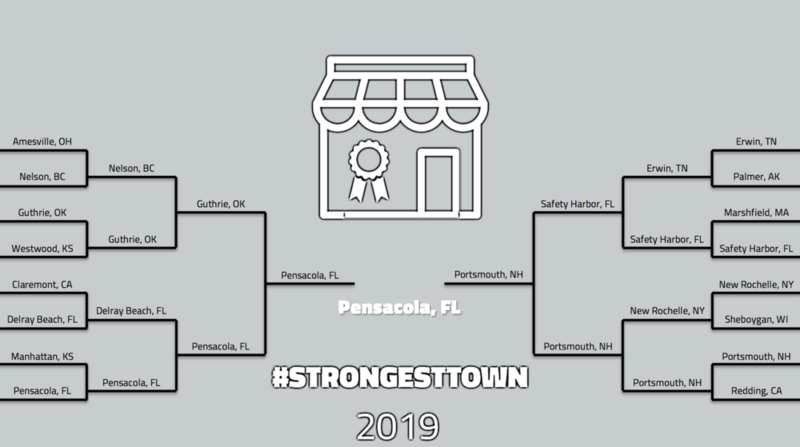 This year's Strongest Town Contest has been a heck of a ride. For the fourth time, we invited local officials, community leaders, and/or impassioned Strong Citizens to submit written entries making the case that they live in the strongest town in North America. One of the best things about this contest is the diversity it showcases every year. This is more striking than ever against the backdrop of our insane 24-hour national news cycle and the political polarization and alienation that it tends to feed. The Strongest Town Contest tells a different story about North America: that in every corner of this continent, there are communities full of smart, passionate, thoughtful people who care deeply about the place they live and have genuinely great ideas for securing its future. There is no blueprint for a Strong Town. The policies that define one aren’t conservative or liberal. A great city doesn’t have to be a certain size or age. What we wanted to see is that the places you advocated for are taking seriously the need to plan for future resilience by sweating the small stuff. That you’re making a #ChaoticButSmart mix of the right investments now—investments in such things as a thriving and unique local business culture; lively, safe streets; and neighborhoods which can provide every generation a good home. We wanted to see places that embrace the bottom-up energy and brilliance of their citizens. And boy, did our contestants deliver. Among the entrants, we had a city of 80,000 that’s busy approving new skyscrapers to get the biggest possible benefit out of its frequent train service to one of the world’s great urban centers. But we also had a town of 150 whose deeply involved citizens and local businesses could boast a list of grassroots civic improvement projects that would be the envy of places 20 times larger. We became acquainted with a mountain paradise whose leaders are proactive about every aspect of future resilience, from affordable housing to wildfire preparedness. We learned about a historic waterfront town that has bucked the trend in its fast-growing suburban region by doubling down on its narrow streets, old-growth trees, and eclectic building pattern as assets. Today, we're ready to announce the winner. The final match-up featured two port cities with 400-year histories: Pensacola, Florida and Portsmouth, New Hampshire. In the end, the winner edged out a victory by a margin of 58% to 42%. We're pleased to announce the winner of this year's Contest: Pensacola, Florida! Pensacola, Florida joins a pantheon of winners that includes Carlisle, Pennsylvania; Traverse City, Michigan; and most recently, 2018’s champion, Muskegon, Michigan. Pensacola is the first champion from the South, and we are proud to welcome them to the ranks. Pensacola impressed us from the start with a Round One application that emphasized its remarkable turnaround in the past decade. The city is growing in population, it is dramatically expanding its local economy and tax base, and it’s doing it largely by focusing on the city’s heart and soul: its historic downtown, which was first built in the 18th century. Pensacola understands that mixed-use, walkable development is a gold mine for cities, and it has encouraged the rehabilitation of vacant sites and amended its codes to promote pedestrian-friendly design, resulting in a lively downtown that is once again the pride of the Florida Panhandle. In Round Two, Pensacola’s photo essay emphasized the city’s truly impressive culture of both entrepreneurship and civic involvement. Pensacola’s annual CivicCon engages residents in urban planning and brings in experts from outside to both educate and converse with locals about the city’s challenges. A huge wealth of training and professional development programs and networking resources are available to ensure that local entrepreneurs can succeed. And as a result, Pensacola boasts strong local business creation and a thriving main street. We congratulate Pensacola on its win, and we sincerely thank all of the towns for their participation in this contest. We'll be back next year for a fifth run of this contest, so please join us then and stick around to see all the work that we do throughout the year. If you've got feedback about this year's contest, we'd love to hear it. Please email daniel@strongtowns.org with your comments.